Teeth whitening in Redwood City involves making discolored teeth look newer and more vibrant using hydrogen peroxide and other bleaching methods. Dr. Savage has a range of options of teeth whitening in Redwood City. Some professionals use lasers while others use trays and kits. You also have over-the-counter options for teeth whitening, but most dentists believe those are not as effective as what can be done at the office at 1130 Hopkins Ave.
Teeth whitening cost in Redwood City depends on what method is chosen. If you use the over-the-counter method, it can cost as little as a tube of toothpaste up to about $100 for the at-home kits. Teeth whitening performed by the dentist can run between $100 and $600 for the trays and more than $1,000 for the laser procedure. When you visit our office, we make your teeth whiter for the most reasonable option available. We work with you and your insurance company to develop a treatment plan that fits any budget. We take time to explain your dental benefits. There are other alternatives to getting whiter teeth, such as porcelain veneers. However, teeth whitening is a better option due to several reasons. The procedure is considerably less costly than porcelain veneers. You also will see your teeth get up to eight times whiter after treatments with Redwood City Family Dentistry. Benefits of teeth whitening also include a brighter smile, more self-confidence and a healthier mouth. Teeth whitening can be performed on almost all adults, but may not be safe for children. Dr. Savage insists that you come for a consultation first to see if teeth whitening is the right option for you. When you ask the dentist to perform teeth whitening procedure, he uses hydrogen peroxide in a concentration that is safe for your mouth. The bleaching agent is added to trays that are fitted for your mouth. You use them for about six weeks. In case of the laser method, the blue light reacts with the hydrogen peroxide to improve the look of your teeth in one visit. Teeth whitening complications include sensitivity along the gum line for a few days following the procedure or for a few weeks depending on which version is performed. You also might experience teeth whitening pain, but it shouldn’t last long. 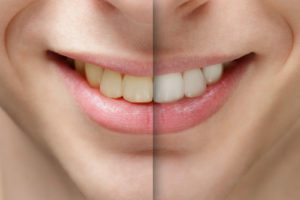 Teeth whitening after effects are better responses to your look and a happier outlook. Before you buy those over-the-counter methods to whiten your teeth, you should visit Dr. Savage for teeth whitening in Redwood City. He will answer your questions related to teeth whitening so that you know what you are taking on. Call now to make your appointment, 650-367-8833, or visit Redwood City Family Dentistry on Hopkins Avenue for a consultation! Teeth Whitening Redwood City. A whiter smile is one of the easiest and most affordable ways to enhance your tooth appearance at our Redwood City Family Dentistry dental practice.